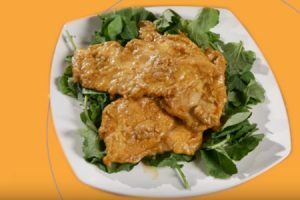 This is a Thai chicken dish that incorporates turmeric and garlic with a delicious peanut and coconut milk sauce. Watch Chef Thu Ha Dinh of Portland, Oregon prepare this simple and healthy dish. Pat dry the chicken breasts with paper towels. On cutting board, slice off fat and tendons. Hold your hand carefully on top of the breast and with a sharp knife, lengthwise cut it into ¼ inch slices. Repeat for each breast. Put the chicken slices into a large bowl. Add fish sauce, minced garlic, turmeric and oil according to taste, mix well. Heat wok or skillet on high; drizzle in a few drops of oil to coat the pan. Put entire chicken mixture into wok and cook until done. Remove chicken from wok, leaving everything else. Add coconut milk and peanut butter into the wok, stir into a creamy sauce. Add chicken back into wok, lower heat, and cover with sauce. On your serving dish, place fresh baby kale leaves or spinach. Top with chicken and drizzle with remaining sauce. PreviousPrevious post:This Thai Salad Roll Recipe Works Perfectly For Hot DaysNextNext post:Is There Any Value in Reading Nutritional Labels?